I am author who writes about traditional food and foodways. My book, The Magic of Fire (2002) is about hearth cooking. I have written an introductory history of bread, Bread, a global history (2011) and am currently writing a history of bread for the University of California Press. A look at an historic mushroom text. Thomas Taylor, Mushrooms, United States Department of Agriculture Division of Microscopy, US Government Printing Office, 1894, p. 7. Zadock Steele, starving, eats too much bread. Firstly, I love dandelion. It is one of the most delicious vegetables. 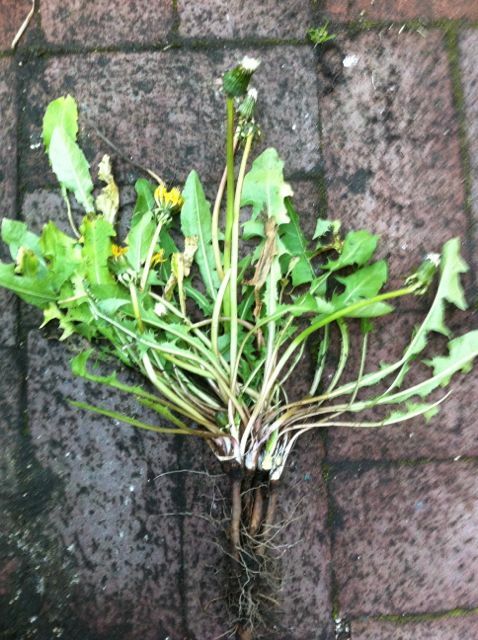 Why dandelion is not a standard on the grocery shelf along with other tiller weeds, like lettuce, chicory, and cabbage is difficult for me to understand. But, there it is. A delicious wild green that remains largely wild. This is an eighteenth-century print of a flour mill floating on the Seine with Notre Dame in the background. 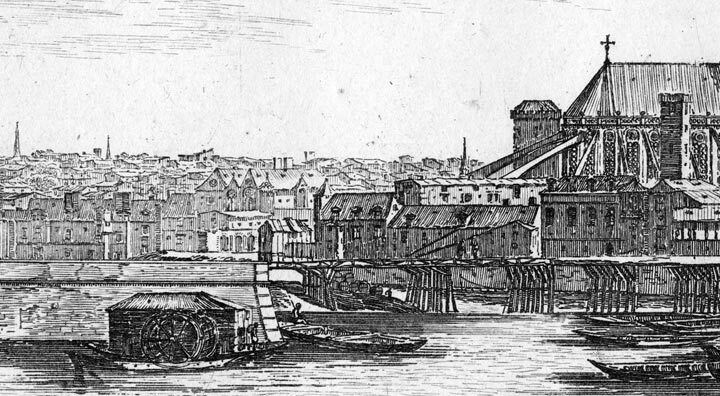 Until well into the nineteenth century mills were attached bridges that crossed the Seine and smaller mills, like the one in this print, were actually small boats, or barges, attached to shore or anchored in the river. The infrastructure for producing bread was everywhere. Paris, in 1800 had a population of 540,000 compared to today’s 2,300,000. This refers to the city itself, not environs If you estimate per capita bread consumption in 1800 at 900g per person and use today’s figure of 130g per person it would seem that approximately 40% more bread was consumed in Paris some two-hundred years ago —490 230 000 grams versus 299 000 000 grams today. Just accepting these as rough figures it suggests the huge number of vehicles — on land and water — that must have been needed to move the grain, the flour, and the breads. Paris did not produce all of its own bread. Demand from Paris fostered a plethora of bakeries in villages circling Paris, with Gonesse, now a suburb of Paris more or less between the two airports, Orly and Charles de Gaulle, being the most famous of the supplier villages. It is known for the quality of its white bread. Even English-language atlases tie Gonesse to its bread. Here is a text sent to me by Jean-Philippe de Tonnac, founder of the extraordinary Facebook Group, Universalbread, and editor of the Dictionnaire universal du pain (2010) from his dictionary. This was written by Jean-Pierre Blazy, the current mayor of Gonesse. 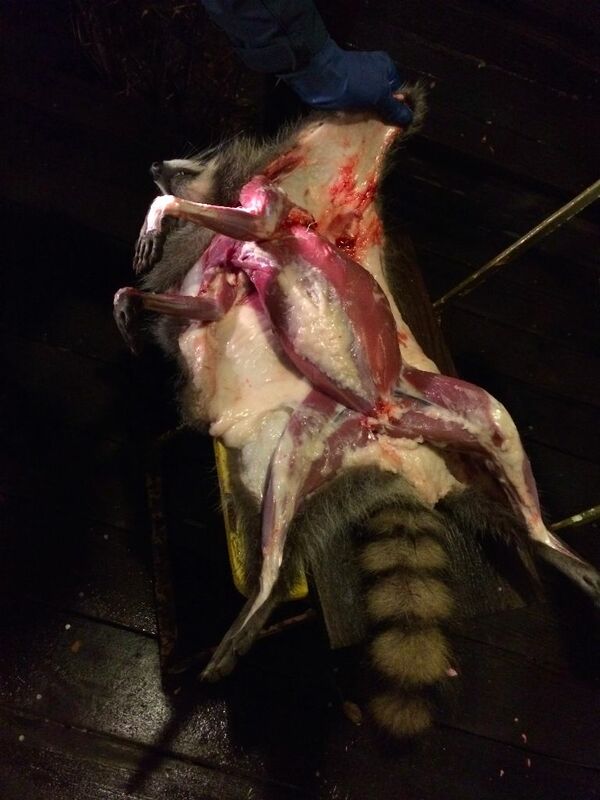 Skinning a road kill raccoon by flashlight. This is the first time I have skinned and butchered road kill. Yes, I was apprehensive. But the raccoon was young, small by raccoon standards, had no visible injuries from having been hit and was clearly healthy. I looked up skinning online but ended up being helped y a friend who had grown up skinning raccoons and other small animals in Arkansas. Certainly, doing this for the first time with someone who has experience is helpful though in many ways the biggest help was simply having the confidence to open the raccoon up and work the knife to separate the skin from the body. Skinning the raccoon is easier than boning a chicken. There is nothing about skinning a raccoon that is as challenging as separating the skin of a chicken from the back without tearing. My primary advice if you haven’t done it before is just to be sure your knife is very sharp and wear thick rubber gloves to protect yourself from accidental cuts. Past that, it is really the first cut up the belly (you will cut straight up to the head) that presents a challenge — and it is purely psychological. There is a layer of fat between the raccoon’s flesh and the skin which makes it obvious to see where you are cutting. The hind and fore-legs have lots of meat. For this small raccoon that is all we saved to eat. I wilted some onion in olive oil in a Dutch oven in the fireplace. When the onion was wilted, added the raccoon, a couple bay leaves, salt, and then wine to just cover. I cooked it at a very low simmer for hours. Utterly delicious. A yeast advertisement that focuses on very old ideas associating poor digestion and ill health with dense bread. 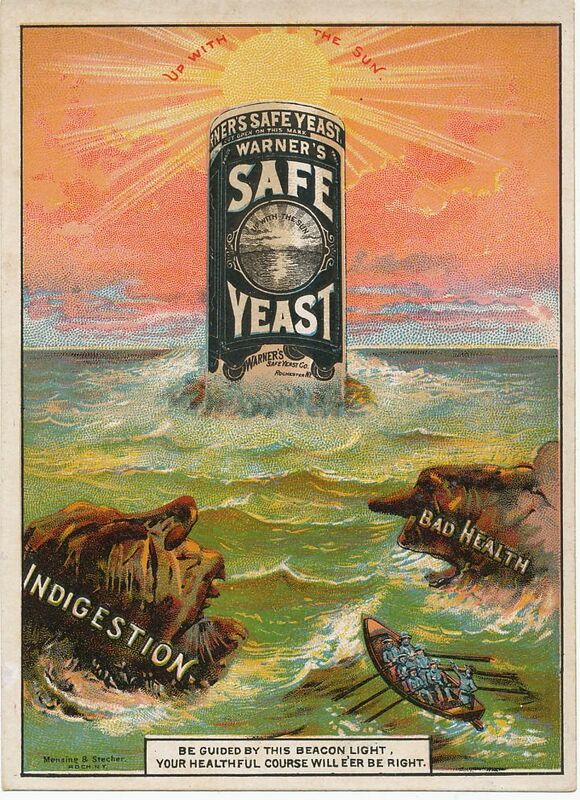 A wonderful massively interesting trade card for Warner’s Safe Yeast circa 1885-1890. To this day, companies sell products by creating fear and then offering a solution. This ad falls squarely in the fear mongering tradition. It would not have seemed so absurd to people in its own time. For hundreds of years dense bread was thought to be indigestible. Its indigestibility had been mentioned in health manuals going back to the 1500s. The poor were often afflicted with gastrointestinal illnesses and for various reasons, their breads were also often dense. In the 1880s the germ theory of disease was still reasonably recent and so the bad water and unsanitary conditions that were in fact responsible for the gastrointestinal ill health of the poor was not yet fully appreciated by popular culture. Thus, in folk culture, dense bread made you sick. That is the back story. Commercial yeast reliably yields a lighter bread, one with a more open crumb, than breads leavened with homemade yeasts or sourdough cultures. Given an unscientific understanding of stomach cramps well made yeasted bread could be imagined to prevent them. But there was a rub. Commercial yeast cost money; many American cookbooks included recipes for home yeast cultures, and had since the early decades of the century. Homemade yeast was a well established part of American home baking, which was itself at this point in our culinary history an established part of the home economy. Waste not want not. Why buy yeast if you could make your own? A simple answer to that would be that yeast is quasi-medicinal in its effects. Who would turn their backs on the health of their family? Affluent households had long been buying commercial yeast by the 1880s. This ad is not addressed to them. Lest you think I exaggerate the nineteenth-century fear of heavy bread. Here is Catherine Beecher on heavy bread published in her 1848 cookbook, Miss Beecher’s Domestic Receipt Book. Perhaps it may be thought that all this is a great drudgery, but it is worse drudgery to have sickly children, and a peevish husband, made so by having all the nerves of their stomachs rasped with sour, or heavy bread. Similar sentiments were expressed into the early twentieth century, if with less animus toward the put upon baker.